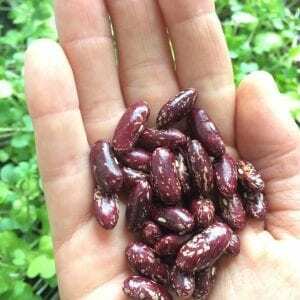 Growing to 6 feet/2 metres this pole bean is a dependable producer of large, heavy, round, deep red beans that look like a ripe cranberry and have a rich full-bodied flavour. They go really well in baked beans and are a staple in Maine baked bean recipes. 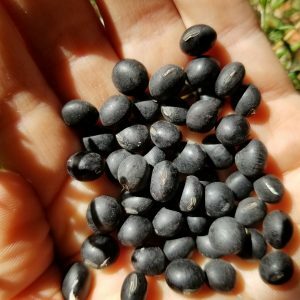 This is a disputed bean as many Indigenous communities claim it to be originally from their villages. I received this bean from Fred Wiseman, Abenaki from Vermont and so rightfully named it Vermont Abenaki Cranberry bean. Beautiful pole bean that sports fiery red flowers that attract hummingbird. This plant needs to be supported as it will climb on anything around it and can actually pull down tutors if not properly staked into the ground. 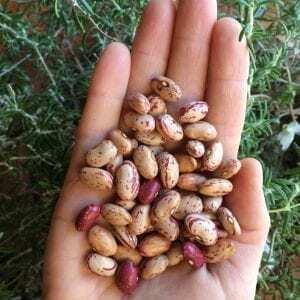 Can be eaten as fresh and dried beans. These beans are cute, almost lima shaped beans that need a trellis to grow or they will crawl all over the ground. The pods are large with 5-6 beans inside. 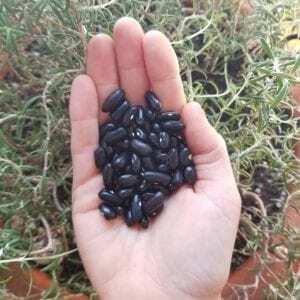 They take the whole season to grow but will provide you with an abundance of seeds when fully grown. 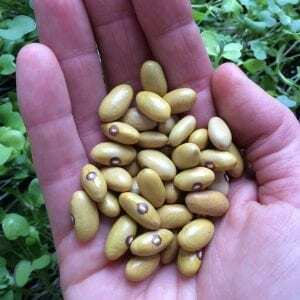 Abenaki heritage bean from Vermont, this bean is perfectly suited for Quebec as long as you get it in the ground in early May. An old French Canadian heirloom originally from the Cantin family of Quebec where it was grown for generations. The mustard colored seeds are used for delicious baked beans. Similar to Worchester Indian (Old Canada Bush Bean) which is one of the oldest types of beans except for the intense coloration of the seed. 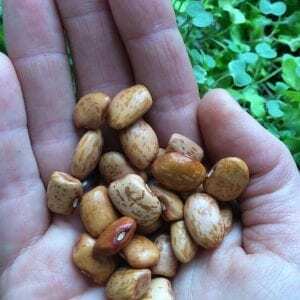 An early bean that dries beautifully on the plant and is easy to shell. 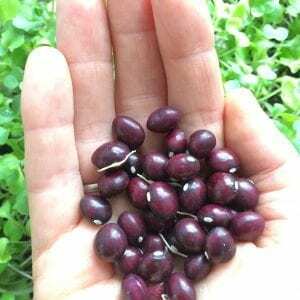 Hidatsa Red is a very productive half climbing bean that can reach up to 4′ . 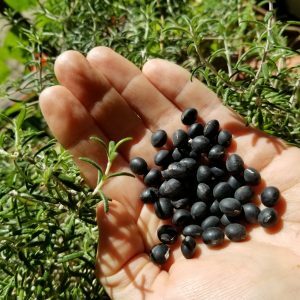 Usually producing 5-7 small seeds per pod, the Hidatsa bean makes for good salads and soups. They are not as big as say the iroquois cornbread but they do pack a nice nutty punch. The history behind the seed is that they come from the Dakota people near the Missouri river. Le Noyau will make it a priority to communicate with the community and find out more about it’s history and the women who worked to save the seed for so many generations. 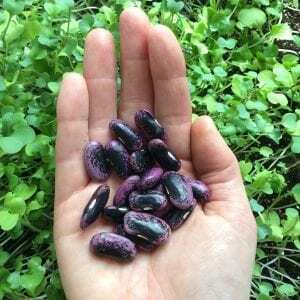 A great cornbread bean that grows very easily, a bush bean but can be semi vining, looking for something to hold to. Alot of pods on the plant, so much so that they get heavy and can fall down. I had to stake them to ensure that they did not fall over. 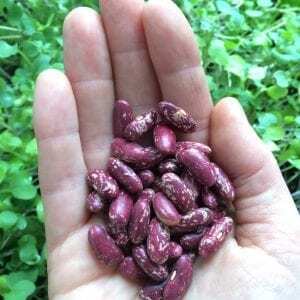 These beans go well in salads, chili and soup. Very versatile and tasty, creamier than a kidney bean. 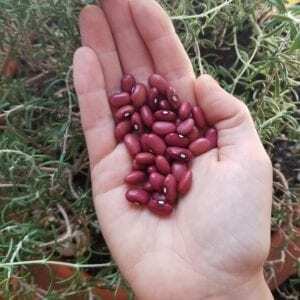 The beans flavoring is fruity, rich and nutty, its consistency, dense and meaty. Jacobs Cattle shelling beans are edible at all periods of maturity. 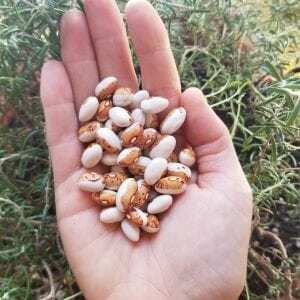 Though Jacob’s Cattle shelling beans can be eaten raw when young, they are most suited as a soup and cassoulet bean as the beans hold their shape under long cooking, stand up well to plenty of seasoning, and possess a rich aroma when slow cooked. 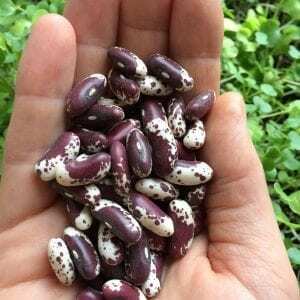 A lovely, spotted red baking bean, “King” ripens early and then expands to several times its original size when soaked. Often used in chili, refried beans, baked beans, soups and salads. Like a Jacob’s cattle bean.